Just one week after my last blog posting, providing a hint of the maximum number of Zen cores supported per socket, a news wave about details of Zen based server processors given in the presentation of a CERN researcher hit the web. The guy works in the institution's Platform Competence Centre (PCC) and manages integration of predominantly prototype hardware according to his CERN profile. So it can be assumed, that anything he says about server platforms might have been provided by representatives coming from the different processor and server OEMs. The 8 memory channels haven't been mentioned before in a leak or patch. And the 32 core number is not related to my posting, as the CERN talk has been held on 29th of January while I published my posting (unaware of the talk) on the 1st of February, after first mentioning the patch already in December. The interconnect subsystem is called "Data Fabric", which knows so called coherent slaves according to the last enumeration list. The "FUSE subsystem" might be replaced by something else like "Parameter block", as it just means a block managing the processor's configuration. Here is a first confirmation of a checkpoint mechanism. This has been described in several patents and might also be an enabler for hardware transactional memory, which has been proposed in the form of ASF back in 2009. Another use case is the quick recovery from branch mispredictions, where program flow can be redirected to a checkpoint created right before evaluating a difficult to predict branch condition. There is a confirmation of the "GMI link" mentioned on an already leaked slide, which mentioned a bandwidth of 25 GB/s per link. The term "Data Fabric" also has been used on that slide. When reporting about the 32 core support, I wrote that some patents used the same wording. 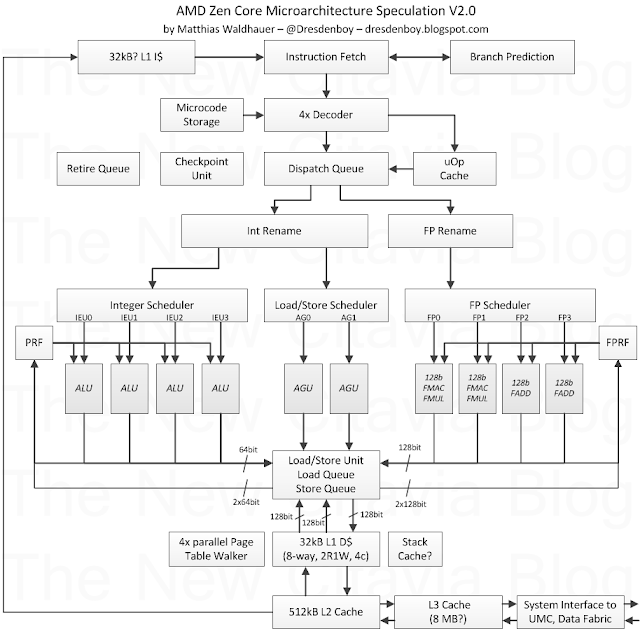 It's actually "core processing complex" (CPC) and can contain multiple compute units (like Zen cores). So they are not the same. AMD patent filings using the term are US20150277521, US20150120978, and US20140331069. FMUL/FADD for FMAC pairing removed, based on some corrections of the znver1 pipeline description. 32kB L1 I$ has been mentioned in some patents. With enough ways, a fast L2$ and a uOp cache this should be enough, I think. Stack Cache speculatively added based on patents and some interesting papers. This doesn't help so much with performance, but a lot with power efficiency. It's still interesting, what the first mentioning of fp3 port for FMAC operations was good for. I thought, it was a typo, but more of the kind "fp3" instead of "fp2" in one case. It could still be related to register file port usage and/or bridged FMA, but probably not that useful for telling the compiler. Due to the correction patch I'm still looking further into the FPU topic, as promised earlier. I'll cover that in a followup posting. Finally there is a hint at good hardware prefetcher performance (or bad interferences? ), as AMD recommends to switch off default software prefetching for the znver1 target in GCC. BTW have you ever heard of a processor core having 2 front ends and one shared back end? Update: There is an update of the bespoken patches, posted on the same day as this blog entry. You can see it here. So far I didn't see any significant additions other than cleanups and fixes. Kristian Gocnik (@I_biT_MySeLf) tipped me off about new mobile Bristol Ridge SKUs, which appeared on usb.org as you can see [UPDATE: the entries have been removed now - visiting the pages may delete your only cached copy in the browser] here and here. That's the same site, where the first Bristol Ridge SKU (FX-9830P) appeared on. I put this together with information found in the leaked slide by Benchlife.info, which you can find in my blog post about a WEI result of an A10-9600P. Using the mobile Carrizo SKUs, the leaked A10-9600P clock, and some sorting, it was easy to map the SKUs to the leaked slide's data. Kristian Gocnik tried it independently and we got the same mapping, except for a consumer A8-9500P he speculatively derived from the pro model, but which is missing on usb.org. So the resulting table likely represents what AMD is going to release as mobile Bristol Ridge chips for the FP4 socket later this year. The model numbers likely simply jumped by one thousand from Carrizo's and an additional thirty points for the 35W variants. Carrizo's wide TDP ranges got split into 15W and 35W TDPs. This might help to avoid the confusion about 15W and 35W Carrizos laptops. The CPU base clocks jumped significantly, while CPU Turbo and (maximum) GPU clocks kind of matured with the fab process. "For its part, AMD engineers showed smart ways of squeezing as much as 15% more performance out of its Carrizo PC processor, simply by applying more aggressive power management to the 28nm design. The Bristol Ridge design was a study in using power management to overcome performance limits tied to heat, voltage and current." Months after the first leaked WEI score, first true Bristol Ridge benchmarks will show, how this improvement translates into real world performance. Hopefully they get tested with dual channel memory, even if AMD or OEMs only provide single channel equipped/designed devices, as for the recent AnandTech Carrizo review. BTW, there are lots of fresh Stoney Ridge Geekbench results in the Primate Labs' database. Update: Of course, these are not OPNs, but SKUs. Added a warning as the linked usb.org entries are gone. AMD Zeppelin (Family 17h, Model 00h) introduces an instructionsretired performance counter which indicated byCPUID.8000_0008H:EBX. And dedicated Instructions Retired register(MSR 0xC000_000E9) increments on once for every instruction retired. There might even be a meaning behind the similarity of parts of the "Zen" and "Zeppelin" codenames. We should rather look at the ApicID bits of the core to provide us the last level cache ID info. Doing that here. 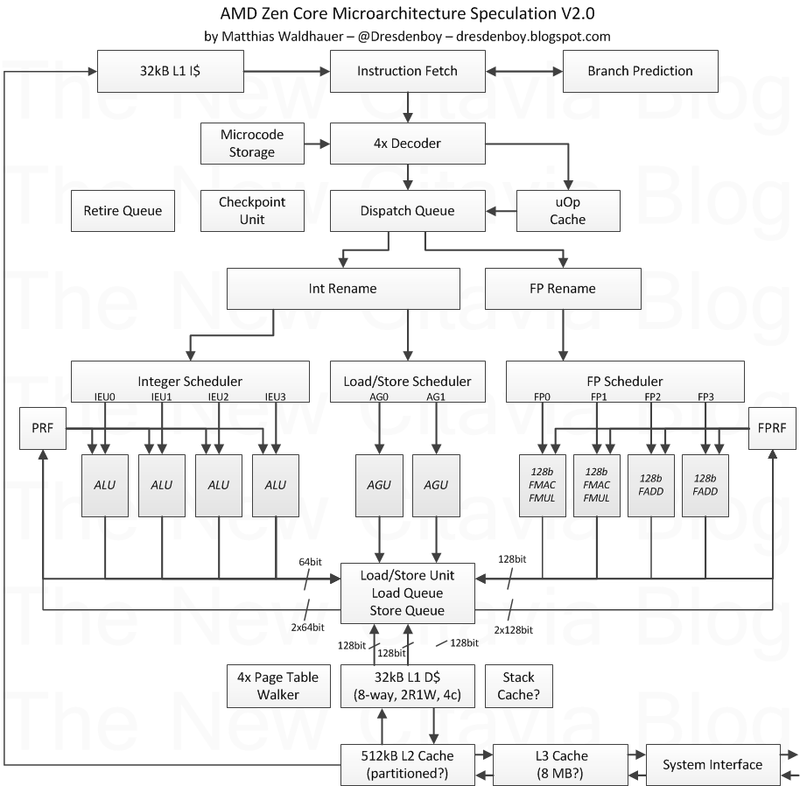 "Core complex" should be similar to "compute unit" and has been used in some AMD patents already. The expression marked in red means a shift right by 3, which equals a division by 8. So with two logical cores per physical core due to SMT, a core complex should contain four Zen cores and a shared LLC. The next line shows the socket ID being shifted left by 3, leaving 3 bits for the core complex ID, which suggests a maximum number of eight core complexes per socket, or 32 physical cores. This number should first be seen as a placeholder, but we've already seen rumours mentioning that many cores.